Call Me Mrs. Rapp: Four Dates! This weekend was pretty special. Not just because I was engrossed in reading and was able to sit in the beautiful sun while I did it - but that was a real treat. John and I went on four - four! - dates, and it was so much fun. I think the last time we went on that many dates was in college, or maybe while we were dating long-distance after college. Either way, I loved every minute of it. The food was great, too! John and I split our whole dinner. We started with an arugula salad with prosciutto, parmesan and lemon juice. The lemon juice really added a freshness to this, and I was so pleased with the salad. Next up was the pizza, which we ate almost all of! We opted for a pizza with red sauce, mozzarella, ricotta, roasted chicken and spinach. It was delicious. Finally, we couldn't leave without trying some of the gelato. We opted for chocolate and peanut butter, and it tasted just like a Reese's cup. Yum! After spending some quality time together at home, I decided I was craving frozen yogurt. John was sweet enough to drive me to our local spot, Yogulatte, where I filled a cup with raspberry, red velvet and tart frozen yogurt, plus mango sorbet. 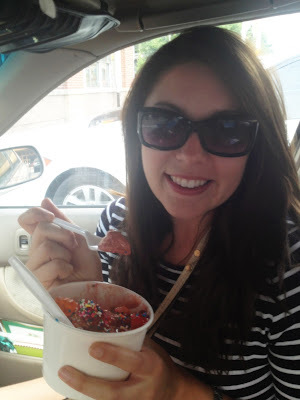 Topped with strawberries, gummy bears and sprinkles, and I was one happy girl. A tiring weekend, filled with not the healthiest of foods, meant we crashed at about 9:30. Oh, and the hair is darker, again. You like? Wish Australia had pinkberry or froyo like the US. I guess we will get something eventually!